The petition system plays an important role, but is seriously underpowered. Xinfang cases are often old complaints that have already gone through courts. It is the nature of most cases that petitioners are desperate for answers. 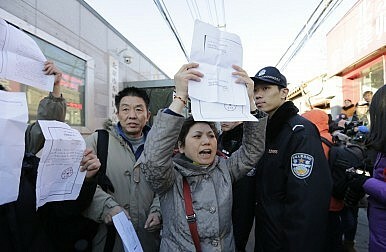 Some cry for hours; while others threaten the children of the Xinfang officials. Cases are sometimes handed down to the next generation. A lack of state compensation for land expropriation, industrial pollution of agricultural land, complaints about corrupt officials…the list goes on. These are all grassroots problems that the country needs to address. In an ideal world, each handled case would make a positive contribution to the government’s image, and a step in furthering the legitimacy of the Communist state. At the village level, there are no subordinate bureaucracies onto which the issues can be pushed. The lack of a scapegoat has fostered an environment at the local level ripe for direct confrontations with the population. Second, reversing a decision risks making the overall bureaucracy look inconsistent. And Xinfang functionaries are determined to save the governments’ face. Despite the high cost of travel to reach provincial capitals or Beijing, petitioners tend to bet the higher levels of the bureaucracy can help them. Ultimately, though, they find themselves hungry, on the streets in an unfamiliar city. For the government, especially in Beijing, the main goal is to avoid escalating tensions. Examples such as mass-suicide attempts and what the government official termed as “actions aimed at disrupting civil peace” shed light on the potential repercussions of unanswered petitions. The Xinfang system lacks an organized method of delivering and storing petitions. Even today, they are often handwritten and based on the petitioners’ ability to document and handle their own cases. The time wasted from the absence of a reliable archiving system for petitions add to the confusion, since officials have no idea about the background of cases. Moreover, constant re-direction by officials only stirs dissatisfaction toward the government. The complainants feel that the state is hiding something and protecting its own elites. There have been numerous government attempts to improve Xinfang. However, reforms have brought little improvement. In the recent anti-corruption campaign for example, anti-corruption officials are often found in Xinfang offices digging into the documents to find traces of local bureaucratic corruption. However, these political campaigns are viewed as short-term solutions to a far more complex problem. Another attempt to reform Xinfang is to build networks connecting the various Xinfang departments. The stated intention was that the petitioners would avoid travel expenses between their cities and Beijing. However, the extent to which this will help the petitioners is questionable. The author found that the web pages are either offline or inaccessible. And when the network works, it simply provides an opportunity to hear Beijing officials reciting the Xinfang policies. The problems explored above are only the tip of the iceberg of China’s societal challenges. As China’s economy continues to develop, disputes, often linked to land use, will create a growing gap between citizens and their government. Xinfang, as it stands today, is a weak governmental body that lacks bureaucratic clout. Yet its position as the forefront government organ in mediating disputes has also made it a useful shock absorber. Abolishing this mediation organ would hurt the Party and its legitimacy. Unless the Party acts quickly with meaningful reforms to the Xinfang, unchecked popular dissatisfaction could push the regime towards greater repression. Leo Lin is a student at George Washington University and currently a summer researcher at the Institute of Contemporary Asian Studies at Temple University Japan. He worked in the Xinfang system, as well as in several legal aid offices in China. China's foreign policy decision-making process has serious flaws that need to be addressed.